This practical handbook has been elaborated by the European Social Fund (ESF) Learning Network “Reinforcing policy learning for Roma inclusion” (also referred to as ‘EURoma+ Network’ or ‘ESF Roma Inclusion Network’). Together with the“Joint report on the use of Structural Funds for Roma inclusion” and the Practical handbook “How to mainstream Roma inclusion in general programmes, projects and interventions“, this handbook is one of the key tools of the Network to achieve its goal of transferring the knowledge gained on the use of Structural Funds for Roma inclusion during the 2007-2013 programming period to the 2014-2020 period. Led, and co-financed, by the Spanish ESF Managing Authority (Ministry of Employment and Social Security), the Network gathers the Heads of the ESF Managing Authorities and National Roma Contact Points from 8 Member States (Bulgaria, Czech Republic, Greece, Hungary, Italy, Romania, Slovak Republic and Spain) together with European Commission representatives. The Network Technical Secretariat was hosted by the Fundación Secretariado Gitano (FSG). The Network has reinforced and complemented, by supporting specifically the planning process of the 2014-2020 period, the European Network on Social Inclusion and Roma under the Structural Funds (EURoma Network), which since 2007 promotes a better use of Structural Funds to foster the effectiveness of the policies aimed at the inclusion of the Roma population. The handbook provides an in-depth and technical analysis of one of the topics identified by members of the Network among the most challenging areas and in which further reflection and progress is needed and where exchange of information and mutual learning between participating countries could be beneficial. It aims to serve as a practical resource for Managing Authorities, Intermediate Bodies and other relevant stakeholders involved in the planning, implementation, monitoring and evaluation of ESI Funds with a view to helping them improve the monitoring and evaluation of Roma-related initiatives under European Structural and Investments Funds (ESI Funds). The first provides an overview of monitoring and evaluation practices in the 2007-2013 programming period and presents the challenges and opportunities for enhancing effective monitoring and evaluation of ESI Funds to promote Roma inclusion in the 2014-2020 programming period. The second suggests ways to improve monitoring and evaluation for Roma-related initiatives financed by ESI Funds, notably concerning information collection systems and the establishment of indicators. 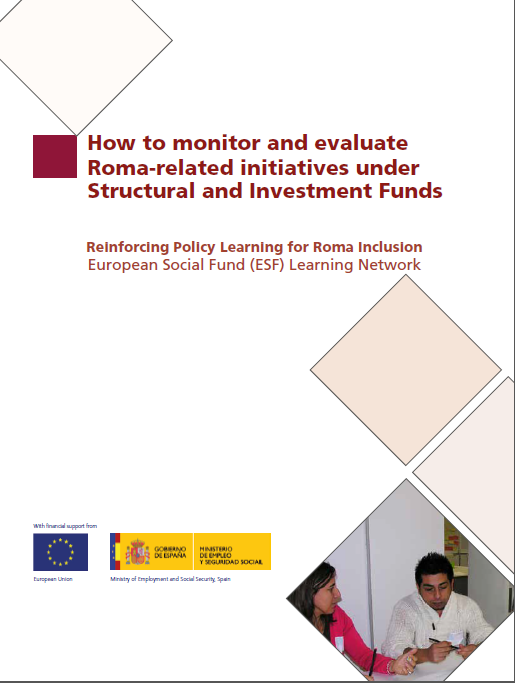 The third focuses on the key elements of the new Regulations that could help provide better information on ESI Funds invested in Roma inclusion throughout the policy cycle of the new ESI Funds. For further information about the handbook, please check the following news item: EURoma+ Network releases practical handbooks on Monitoring & Evaluation and on Mainstreaming of Roma inclusion under ESI Funds.